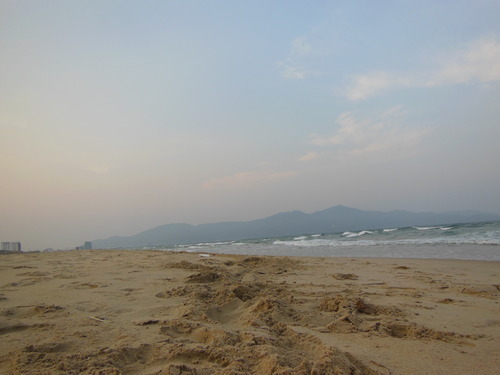 A short while ago (okay, maybe a longer while ago…) I took a 2 week trip through Vietnam with my boyfriend. I had a blast and it was great to see and experience parts of Vietnam other than Hanoi, though I think the city still holds its place as my favorite. 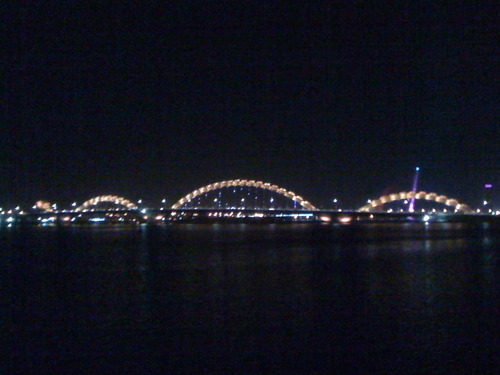 A close second though turned out to be Danang. I only managed to catch a quick glimpse of the city, but it was a great one. 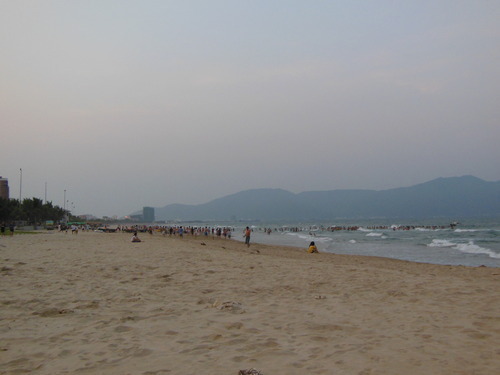 Danang has beautiful beaches, some that are almost completely deserted beaches and then less than a kilometer down, have more people crowded onto a beach than I’ve ever seen! (And I’ve seen a lot of beaches.) All along the beaches huge resorts are being built, which saddens me a bit. 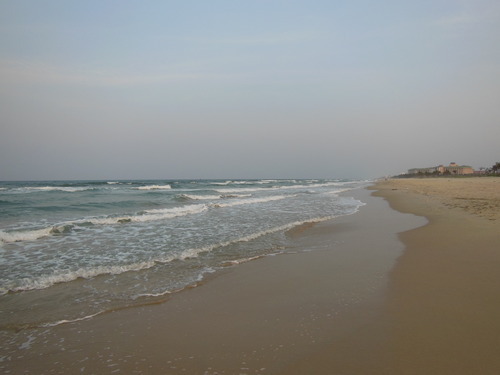 We stayed in a smaller hotel that was within walking distance from the beach. I’m not sure why this can’t just be good enough sometimes, but that’s probably best left for another post. There are way more people in this crowd than the picture lets on. Check out all the people in the water. There are so many that they almost look like a solid line. Look at all that empty beach! Spread out! 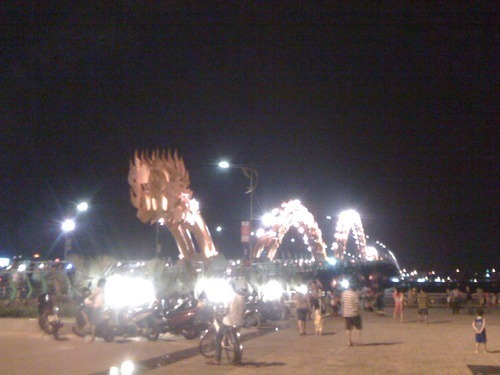 The bridges in Danang are very unique, my favorite being a bridge that’s shaped like a dragon. The city has a nice blend of “modern” and “traditional” (I put these in quotes as I find the words rather subjective. ), without overdoing either. One of our (not so) favorite, but memorable experiences involved durian ice cream from a small, sidewalk ice cream stand. I ordered it by accident due to my poor Vietnamese skills, picking chocolate and what I thought was vanilla. Max instantly began to complain that there was something wrong with his vanilla ice cream that tasted like “motor oil”. Since it had come from an old freezer and was literally cut off a giant block of what seemed like equally old ice cream, I just assumed that it just wasn’t very good, or had possibly started to go bad. I finally took a bite and he was right, but to me it tasted more like gym socks. Later on, whilst enjoying a beer to wash the bad taste away from our mouths, we decided to Google something to the effect of “Vietnamese fruit that takes like motor oil” and lo and behold, one of the top choices was durian! I’d never tasted it before and to be honest, probably won’t again. I’ve since smelled it and it also smells rotten! Certainly not my taste at all, but many people here seem to like it. Maybe it’s an acquired taste? No pictures of the durian ice cream, but here’s another picture of the gorgeous My Khe beach. 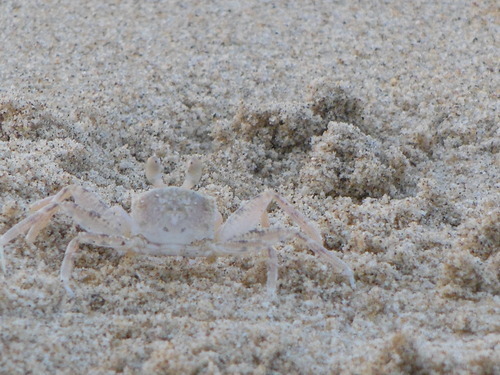 And since I took about 50 pictures of these things, here’s a sand crab. This is way zoomed in, they’re really only a few centimeters long.